My husband is one of the only men I’ve ever met who enjoys scented candles, potpourri, and air fresheners. He says “Oh, that smells nice!” when I put lotion on in the car instead of making coughing and gagging noise. It’s nice that he likes things to smell ‘good,’ but a lot of those chemical air freshener products make me sneeze! This natural hanging air freshener is my latest response to his desire to make things smelly (in a good way) and my desire to keep air-born chemicals at home and sneezing to a minimum. If you’re a crafter, I’d guess you already have most of the needed supplies on hand! – These don’t last for months and months. The scent disperses in a few weeks or days, depending on where you put your air freshener and how much oil you used. That’s not a problem, though – just ‘refill’ it with a new scent! 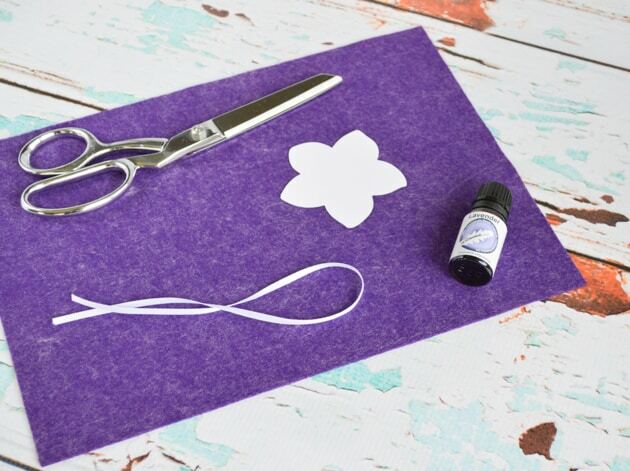 – Especially if you’re not familiar with cutting felt, simple designs are best. Shapes like stars, flowers, Christmas trees, or even just a circle are easiest to cut out. 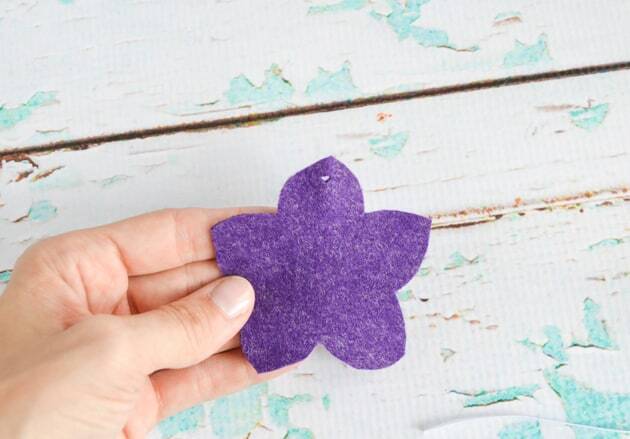 – Don’t feel like you have to use a piece of plain felt – you can add essential oils to other felt projects. Need inspiration? 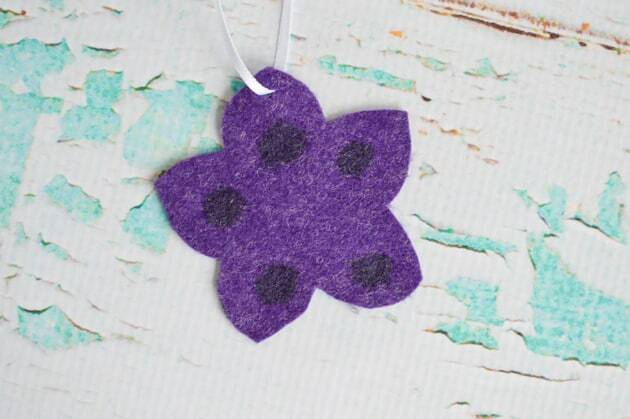 Check out this blog devoted to free felt patterns and tutorials. 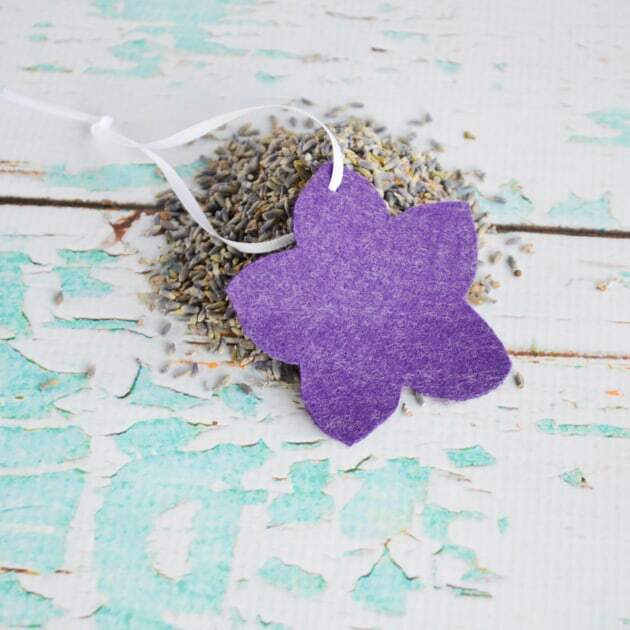 Just keep in mind that essential oils can temporarily or permanently stain or alter color so check them on a sample swatch of felt before dousing a beautiful handmade ornament! 1. 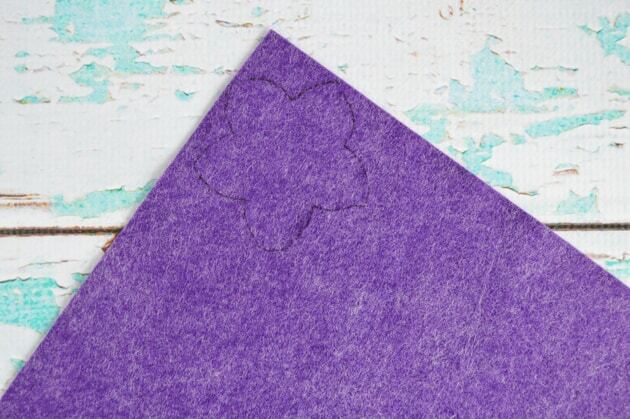 Trace your pattern onto the felt. 2. Cut along the traced lines and then cut a small hole on the ‘top’ for a ribbon. 3. String the ribbon through the hole and knot it at the top to form a loop (or leave it open to tie around something later!). 4. Add your favorite essential oil(s). The oil will probably leak through the felt, so make sure you protect any surfaces that could be damaged by placing a plate, paper towel, or something else under the felt before dropping on the oil. The oil will show dark and wet at first, but the marks on my felt faded within half an hour. 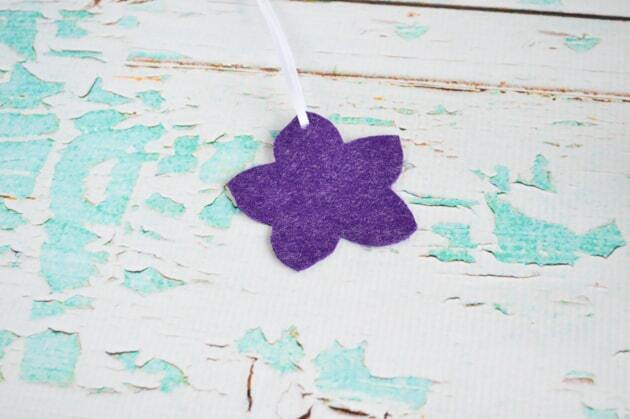 These air fresheners are great for small spaces like closets and cars. I also think they’d work great as ornaments on a Christmas tree! If you have an artificial tree, you could make these and then use evergreen oil to make your tree smell ‘real.’ They could also make unique package decorations – just use one instead of a traditional gift tag and scent it with something special for the recipient. Shortly after writing this tutorial, I discovered how much of a difference high quality essential oils can make. With the picture essential oil, my air freshener ran out of juice pretty quickly. Then I switched to DoTerra oils, which are very potent. Now the scent sticks around much longer! I signed up for a wholesale account, just like my Costco membership, that allows me to get a great discount without any obligation to sell anything. It’s pretty cool. I know there are many brands out there to choose from, so make sure to use one of the potent ones if you want your air freshener to stay fresh! 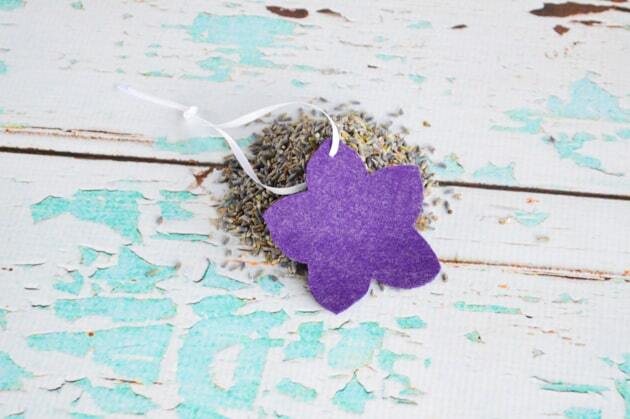 What other uses do you have in mind for these quick and easy natural air fresheners? Fantastic method! I will show it to my daughter. She will be glad to do in the weekend! She is 6 years old and she get very quickly bored from all the games. 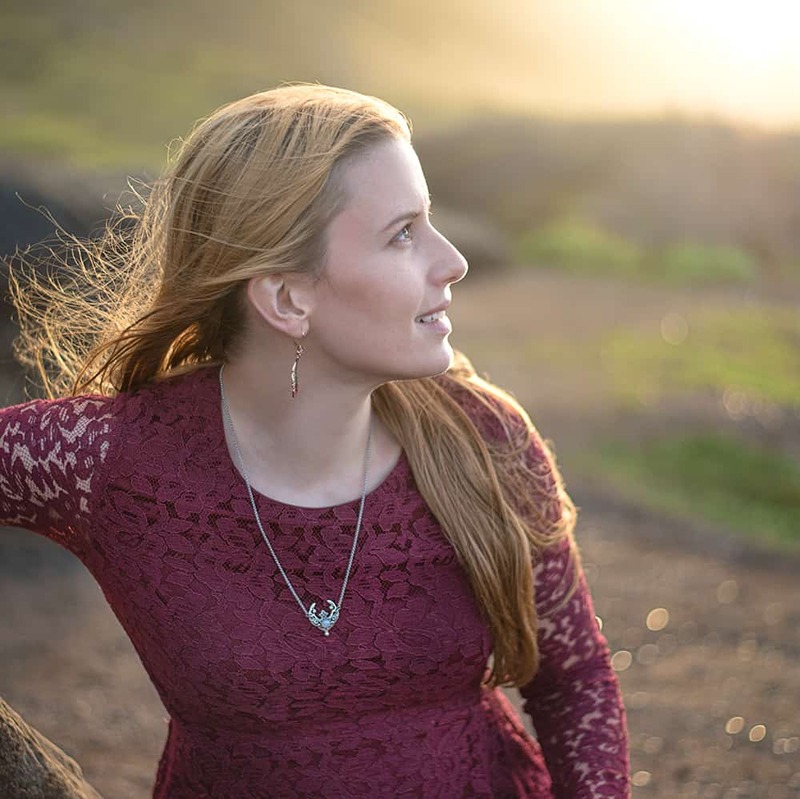 Thank you for sharing this article! Best regards! Thank you and I hope your daughter enjoys this little project!